Spring is in the air!... Well, no it's not really; it's been either pouring with rain or blowing with snow drifts for the last few weeks. However it is mid-February at the time of writing and today in Oxford it is not too bad weather-wise. I can see snowdrops and crocuses budding, which means that the change in the seasons is not far off. And at this time of year my mind inevitably turns to the question: What will this year's crop circle season be like? Also as the early flowers start blooming so has the radio career of an acquaintance of mine, Trystan Swale. Trystan is a Fortean-Skeptic, but one who lives a world away from Droike (See the HPANWO Forum in the Links column); in fact he's very amiable and easy-going, and I wish him luck with his new venture. I've met him at several conferences like the ASSAP Seriously Strange one in 2011, see: http://hpanwo-tv.blogspot.co.uk/2011/09/assap-seriously-strange-conference.html. He used to present a Skeptic podcast called Righteous Indignation, and this has now closed down. But after moderately short break he is now back on the air with a brand new podcast: Fortean Radio: http://www.ripodcast.co.uk/ (The old RI archive has been taken down but most of the shows can still be obtained from this cache on fellow-presenter Hayley Stevens' website: http://hayleyisaghost.co.uk/righteous-indignation-back-catalogue/). Trystan's new Fortean Radio programme is aimed more at the open-minded instead of the Skeptic end of the Fortean spectrum. It's already on its second episode and in this one he interviews Paul Devereux of "earthlights" fame. In the programme they discuss crop circles and bring up something that I'd never heard of before, something which appears to be an attempt to clear up the central controversy of the entire crop circle phenomenon: the 100% Man-Made Hypothesis. It's hard to say for sure when crop circles began. The earliest reports of structures fitting the definition date back to the 17th century but these were very rare. It's possible they're a related manifestation of patterns seen in other media, like sand, snow or grass. The modern era, the time in which they became commonplace and sophisticated in shape and design, took off only in the 1970's. As their name suggests, the were originally just circles or formations of circular figures, but these changed to more elaborate forms; however the name had stuck as a linguistic anachronism, in the same way people talk about "film in a camera" even in the age of digital photography. The phenomenon entered popular culture in a major way in the early 1990's; they were debated in Parliament and even inspired advertising campaigns; here's a TV programme about them from that time period: https://www.youtube.com/watch?v=XLVHJ_Q3LFI. Theories about their origins ranged from UFO's and mysterious earth energies to rutting hedgehogs. 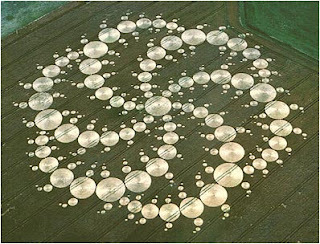 Then one day an explosive revelation burst into the media: the crop circles had all been created by two elderly Wiltshire men, Douglas Bowers and David Chorley. The two men did a public demonstration in a field to show off their capabilities and the popular furore died down with a "Oh well, another mystery solved" closing line. Crop circles were forgotten by most people, including myself. Then many years later I was watching Esther Rantzen's Esther show and she was interviewing Andy Thomas (See: http://hpanwo-radio.blogspot.co.uk/2012/12/programme-26-podcast-2012-mayan.html) and he was discussing all the latest research into crop circles and I said to myself: "What? Is it still going on?" Since then I've delved into the subject in its current location, not mainstream but still a big part of the alternative milieu. Even within the alternative community opinions are deeply divided. Some maintain that they're all the work of "Doug and Dave" and their proteges, others that a supernatural element still endures; and even that Doug and Dave were set up as disinformers to quench the rising public awareness of the crop circle presence. For some who believe in the 100% Man-Made Hypothesis, crop circles are still a supernatural creation with UFO's and higher powers operating through the planks of the human circle-makers. Others just see it as a revolutionary new form of landscape mega-art. The controversy between the two sides has become quite vitriolic; many conferences now ban those who support the 100% MMH from attending, see: https://www.youtube.com/watch?v=YgfuUwM4xQQ. 100% MMH proponents accuse crop circle "believers" of wishful-thinking and an unwillingness to face the "truth" that they're all just simply made by people. Those who support a supernatural explanation see the 100% MMH-advocates as "shills" and "liars" trying to debunk the phenomenon because the Government are paying them to, or just out of pure spite and a sadistic enjoyment of shattering the dreams of others. The controversy continues to this day; and recently a challenge has been issued that might just clear the matter up once and for all, the Crop Circle Challenge 2013: http://www.cropcirclechallenge.co.uk/. The claim made by the 100% MMH faction is that all crop circles are made by humans using simple methods and tools, garden rollers, the "stalk-stomper", a plank with a loop of rope attached to it, and a surveyor's kit: tape measures and land-markers etc. The circles are created this way secretly during the night. In order to demonstrate or discredit this claim, an enigmatic and shadowy group called "the EHA" has opened a competition to anybody who can recreate the spectacular Milk Hill formation of 2001 under controlled test conditions that match those professed by the 100% MMH-ers. If successful, the winner will receive a hundred thousand pounds as a cash prize. They would also no doubt go down in history as the people who finally settled the crop circle dispute. If they fail or do not apply, it will definitely inflame and invigourate the critics of the 100% MMH. Trystan Swale and his fellow hosts Andy Russell and Anna Nimeton are not impressed by this challenge and explain why in their show; Swale has also written an article on his blog about it: http://www.leavesthatwither.co.uk/crop-circle-challenge-2013-is-it-real/. Their disapproval centres on the list of rules for entry. 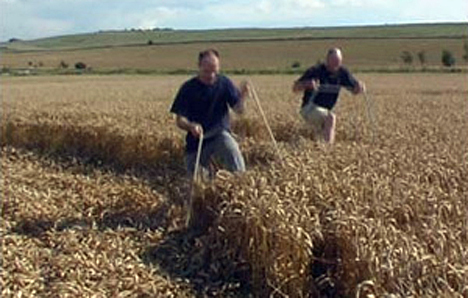 Crop circle-making teams have to apply to a panel of referees to take part and will need to send in a CV, up to and including high-definition video recordings of themselves at work. This can get the applicants into serious trouble because crop circle-making is technically a criminal offence. It involves trespass and vandalism, and in fact once a circle-maker, Matthew Williams, was actually prosecuted for his nocturnal planking activities (a fact he wears on his sleeve with enormous pride! See: https://www.youtube.com/user/truthseekers666). According to Trystan, Anna and Andy, the terms and conditions are too demanding and even "ridiculous", claiming that the referees are insisting on identical weather conditions to the time the Milk Hill formation appeared, including a similar amount of water and mud on the ground. There are also no set criteria about what constitutes a "replica" that can be agreed on by referees and entrants alike. They also don't agree with their challengers that a lack of footprints equals no human feet. The actions of the circle-making methods erases footprints anyway, the say. Also the entrants will not be told until thirty-six hours before the commencement of the experiment which field the Milk Hill replica crop circle will be made, except it probably will not be the same location; this adds to the lack of clarity in the Challenge's rules. The environmental conditions and other variables, like the kind of crop matrix the entrants will be working with, will affect the outcome and even the choice of tools the circle-makers will have to prepare. Also nobody knows exactly who the organizers of the Challenge are. Nobody can say for sure what "the EHA" is. Rumour has it that it's a codename for the actress Sarah Miles, and she is apparently the "representative" for them. Sarah Miles was once a major star in films like Ryan's Daughter in which she headed the cast along with Trevor Howard and John Mills, but today she is semi-retired and only takes part in minor TV and stage roles. She is very keen on natural health therapies and drinks a cup of her own urine once a day to prolong her life (Personally I'd consider departing this mortal coil a few years early as a fair price for not having to subject myself to that daily practice). Trystan has contacted them asking for more details, but found their spokesman somewhat "spikey". Swale, Anna and Russell conclude that the test is loaded and biased and intended to be unwinnable. Also a successful or unsuccessful outcome would prove nothing on its own about whether the 100% MMH was right or not. I have to agree with Trystan, Anna and Andy's criticism of the Crop Circle Challenge 2013, including their irrelevant disparagement of its website design. However I think that the principle behind this notion is a good one and with a little adaptation could be made to work creatively and decisively. What the Challengers basically need is to learn a bit of professionalism. They need to sit down and work out some fairer and more comprehensive rules; and they need to negotiate with the 100% MMH community before even designing the experiment, let alone deciding the terms and conditions. They need to be more transparent; we need the names and addresses of everybody in "the EHA" and they need to be willing to talk to the media and answer enquiries politely and informatively. They need to get a proper team of lawyers involved to work with both the 100% MMH community and its critics; once they present a more competent outlook they may attract more investors to provide even more prize funding. My own suggestion, as a speculative outsider, is that perhaps a replica of a pervious formation is a bad idea and instead the Challenge referees and entrants could decide on a new design, sufficiently complex to satisfy those who believe in the supernatural origins of crop circles, but simple enough to be realistically achievable. Perhaps the experiment should be a two-stage process, with a simpler and cheaper preliminary test that the entrants would have to pass before progressing to the main Challenge. Recreating the environmental conditions is a fair point. The wet and windy weather that lashed down on Milk Hill on the 12th of August 2001 will be available for analysis in the records of the Met Office; and waiting for another wet and windy night during an English summertime is hardly a major obstacle! However if the entrants need to plan in advance where they'll be working and know what kind of tools to bring and what kind of clothes to wear etc, then the Challenge referees must allow them to know all that they need to know beforehand. It's worth comparing the Crop Circle Challenge 2013 literature with that of James Randi's Million Dollar Challenge, see: http://www.randi.org/site/index.php/1m-challenge.html which may have inspired our cerealogical pundits to produce an antithesis to it (They are not alone in doing that, see: http://hpanwo-radio.blogspot.co.uk/2012/10/programme-18-podcast-ross-hemsworth.html). Whether you agree with Randi's views or not makes no difference to this point: There is no doubt that he knows exactly what he is doing and has worked meticulously for almost fifty years to assemble a proficient and unbreakable competition that is legally watertight and leaves no doubts on the part of any potential entrant. The organizers of the Crop Circle Challenge should not allow a difference of intellectual opinion to get in the way of learning how to do the job properly from the master. My own views on crop circles have changed considerably over the years. As I said above, when they came back to my attention via Andy Thomas on the Esther show I was surprised and intrigued. For many years I thought that nearly all of them were supernatural and made by UFO's or aliens; and that only a handful of the simpler ones came off the planks and rollers of Doug and Dave. When I went to the Glastonbury Symposium in 2010 I met many people who still believe this, see: http://hpanwo-tv.blogspot.co.uk/2010/07/ben-goes-on-tor.html. Since then I've learned that most of them can be categorically accounted for by human activity. The actual ratio vacillates quite a bit depending whom you talk to when seeking help for your investigations, but there's no doubt that the man-made ones constitute a significant majority. Since then I have teetered on the brink of accepting the 100% MMH quite a number of times, but somehow just when I'm about to come out of the closet as a true blue "plankophile" some titbit of information comes my way to push me back into uncertainty again. This is why I'd very much like to see a proper experiment on this subject done. The Crop Circle Challenge people have given us a brilliant idea but failed miserably in their attempt to apply it practically. Also Trystan, Anna and Andy are correct when they say that the outcome of the Challenge alone would not necessarily solve the conundrum totally. In fact there would have to be a number of different experiments done before we'd be able to say for certain whether the mystery had finally been solved. Even then when the study is as complete as it can be, there will be the die-hard resistance fighters on both sides. If the Challenge is successful some will still claim that aliens are involved; and conversely if the circle-makers continuously fail to live up to their boasts then some Skeptics will still want to raise the bar further and further, unable to concede that there's more to this phenomenon than they've always insisted. Either way I don't think I will be joining the ranks of either militia. A correctly-conducted experiment would make me decide, I promise. I'd like very much to see the Crop Circle Challenge done properly because, quite frankly, once I know for sure, I think I will enjoy the phenomenon more... And there are plenty more mysteries waiting in the wings to step out onto the stage to enthral me.